World Laughter Day was created in 1998 by Dr Madan Kataria, founder of the worldwide Laughter Yoga movement. The celebration of World Laughter Day is a positive manifestation for world peace and is intended to build up a global consciousness of brotherhood and friendship through laughter. Its popularity has grown exponentially with that of the Laughter Yoga movement (now counting over 5000 Laughter Clubs worldwide on all 5 continents). 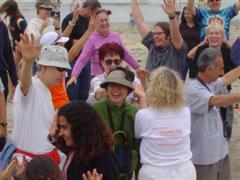 The first World Laughter Day gathering took place in Mumbai, India, on 11th of January 1998. 12,000 members from local and international Laughter Clubs joined together in a mega laughter session. 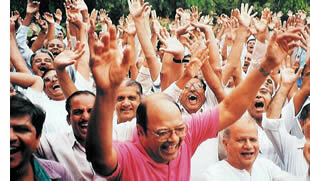 HAPPY-DEMIC was the first World Laughter Day gathering outside India. It took place on 9th January 2000 In Copenhagen, Denmark and more than 10,000 people gathered at Town Hall Square. 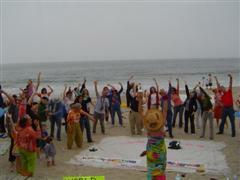 The event went into Guinness Book of World records. World Laughter Day is now organized on the first Sunday of May every year. 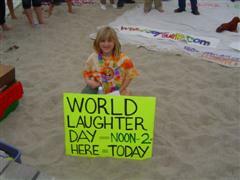 Hundreds of people (oftentimes thousands) gather worldwide on that day to laugh together. 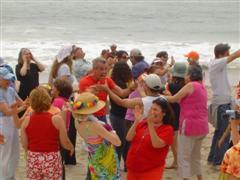 Such an enthusiastic participation is proof that Laughter Clubs are not a laughing matter. Why a World Laughter Day? Laughter is a positive and powerful emotion that has all the ingredients required for individuals to change themselves and to change the world in a peaceful and positive way. It directly impacts ones electro-magnetic field and creates a positive aura around that person. 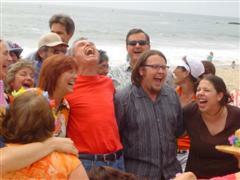 When a group of individuals laugh together, they create a collective community aura. Electromagnetic waves from a group who are laughing every day form a protective envelope around that area to protect it from negative forces (similarly, people believed in ancient India that one saintly person was enough to protect the entire village). Laughter is a universal language, which has the potential to unite humanity without religion. 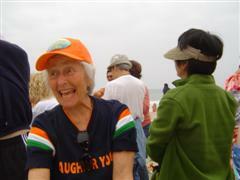 Laughter can establish a common link between various religions and create a new world order. The idea may sound over-ambitious, and maybe it is. But maybe it is not. It is our deep belief that laughter and only laughter can unite the world, building up a global consciousness of brotherhood and friendship.